Please note that this analysis is intended for informational purposes only. Your actual cost of goods may vary depending on shipping charges, ingredients used, and time spent on each batch of soap. First, let’s discuss some basic overhead costs incurred by any small business (be it soaping or clothing design) like heat, electricity, phone bills etc. There are also some fixed costs, such as postage, pans, spoons, an extra burner, shelves etc… When we initially built our soaproom, we added shelving, cabinets, a range, and bought new equipment. All together, this added up to about $400.00. However, while these are all up-front costs, they still need to be amortized over the life of your business. Assuming you make no additions or need new equipment, amortizing this out for 1 year is ($400.00/12 = $33.33) $33.33 per month so add this to your overhead. You’re already up to $363.33 before even starting your month! And let’s not forget insurance! 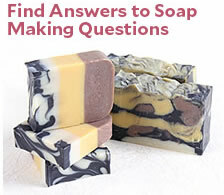 This is the one, essential thing you should have before starting any soap business. On average, this will run about $20.00 per month. So, your grand total for all your fixed overhead costs, is $383.33. Lye: $10 for 32 oz. That works out to just $.56 per bar when ordering oils in 1 gallon sizes. If you were ordering in larger sizes, your price per bar would go down even further. This basic recipe looks pretty affordable on the face of it. Let’s add in your molds. Of course, you can start with a $4 drawer divider (and many soapers do! The ‘Martha Stewart’ silverware divider is a popular one!) or a $20 wooden mold. Soap molds for cold process soapers for smaller batches (12 pounds and under) can get more expensive (up to $199) for some intricate molds. For purposes of this example, we will figure in a $50 mold. Amortizing that over the year of your mold, you’ve spent $4.17 a month on your mold. If you make 1000 bars a month, the mold adds $.04 to your cost per bar. Labor also figures into this equation. How much do you want to pay yourself? $6 per hour, $15 per hour? For this example, we will use $15 per hour which is a healthy hourly wage (especially since the satisfaction of being self employed makes many want to work for themselves for free!). To figure out your recipe, it normally takes a computer savvy soaper just a few minutes with this handy lye calculator. If you’re doing it by hand, it may take up to 30 minutes. For this example, we will use 30 minutes to prepare the raw materials (scoop, measure, and make up your recipe). That adds $7.50 per batch. Assuming you’re making a 36 bar batch, you’ve just added $.21 per bar in prep and clean up time. Actually making the batch can take as little as 5 mintutes to as much as 30 minutes (I’m believing that you’re using a stick blender to help speed up trace). 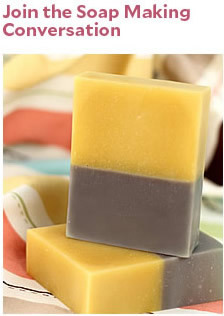 If it takes 30 minutes to melt, mix and trace your soap, you’ve added another $.21 per bar in actual manufacturing time. You do need to wrap and label your bars. If you’re doing a cigar-band type of wrap commonly favored by soapers that you print out on your own printer, you can normally fit 4 wraps per sheet of paper. Adding the wear and tear on the printer, the paper costs, ink cartridges etc… works out to about $.07 per bar. This assumes that you are doing a full color print, and using paper stock that is $.02 per sheet (this can buy a nice heavy sheet of paper). How many bars can you wrap and label per hour? It depends on if you’re trimming your soap, if you’re using a mold that makes the bars even and square for you already and how quickly you can get your production line down. Even if you have to trim every bar of soap, you should be able to trim and label at least 30 bars per hour (that’s a full 2 minutes per bar!). This adds $.50 in labor per bar. This amount errs on the side of caution. If you get a nice little production line down, you should easily be able to trim and wrap one bar per minute, bringing your costs down to $.25 in labor for trimming and wrapping. In order to make your overhead of $383 per month, while paying yourself and replenishing your soap, if you wholesale your soap at $2.25 per bar, you need to sell 554 bars per month. If you manage to increase your trimming and wrapping speed so you can do one bar per minute, you only need to sell at wholesale pricing, 398 bars. Just think if you were selling at full retail! Your contribution towards overhead would be $2.76 per bar (assumes a 4 oz. bar with a $4 sale price)! You would only have to sell 120 bars retail to make your overhead back. By purchasing in bulk, you’ve saved a full $.09 per bar! What if you doubled your batch size? The same prep and clean up time applies, and the same production time. Your labor then becomes only $.21 per bar for prep, cleaning and production time! This saves a full $.21 per bar. Coupled with the $.09 on materials, you’ve now saved yourself $.30 per bar. Future articles will include a cost analysis of using more expensive oils in your batches.